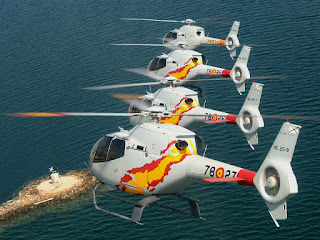 "Patrulla ASPA" are the current Spanish Air Force helicopter aerobatic display team, flying with five Eurocopter EC-120 Colibri helicopters. The team was formed on Sept 23, 2003 at the Armilla Air Base. 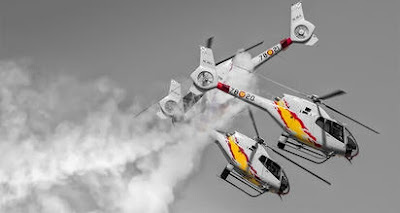 The first demonstration of the new team was on May 16, 2004 in Sevilla and their foreign debut was at the Portugal Air Show in 2005. 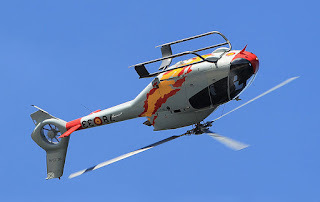 The characteristic sound of rotor blades whirling through the air; the smell of kerosene; the frenetic activity of a place awash with helicopters … : every pilot has experienced this sensation at some point in his or her life. Their history, forged since its beginnings from the aeronautic spirit of their pioneers, was cemented thanks in no small part to the impulse of Lieutenant General Eduardo González-Gallarza: Chief of Staff of the Air Force back in 2003. 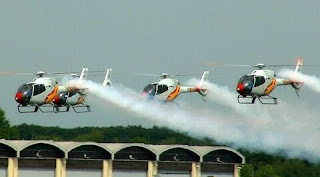 He granted a few pilots: daring, and with initiative, the green light to overcome the many challenges of creating an acrobatic helicopter team. Since that month of May in 2004, and until the present day, every rehearsal and every exhibition has strengthened the bonds in the unit that go beyond companionship. The feeling of unity reached a peak in the celebration of the 5th anniversary of the unit on December 19th 2009, where old friends and colleagues met, shared anecdotes … This way of working: as a family and as a team, is at the heart of the Patrulla Aspa. 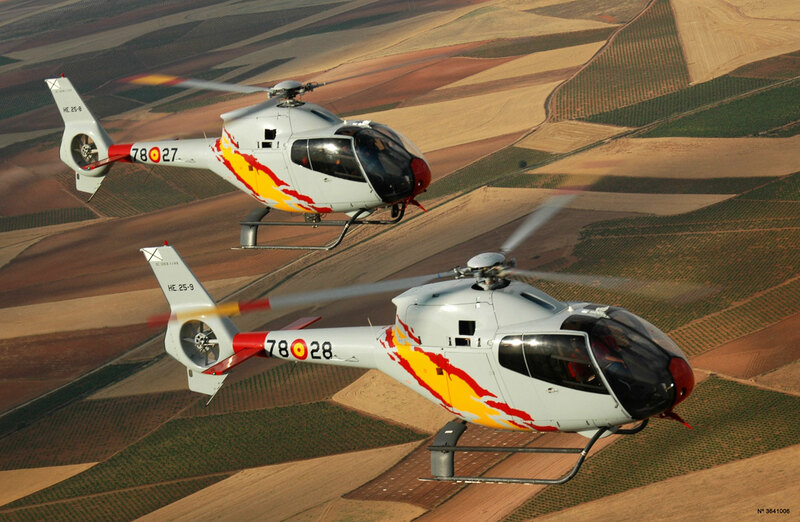 It encourages us every day to persevere in our work and to broadcast ever more the name of our beloved air force.